Kennedy took office following the November 1960 presidential election, in which he narrowly defeated Richard Nixon, the then–incumbent Vice President. He was the first Catholic to become President, and became the youngest person elected to the office. His inaugural address encompassed the major themes of his campaign and would define his presidency during a time of economic prosperity, emerging social changes, and diplomatic challenges. This inauguration was the first in which a poet, Robert Frost, participated in the program. Presidential inaugurations are organized by the Joint Committee on Inaugural Ceremonies. For John F. Kennedy's inauguration, this committee was chaired by Senator John Sparkman, and included Senators Carl Hayden and Styles Bridges, and Representatives Sam Rayburn, John William McCormack, and Charles A. Halleck. [Sinatra's ball] may have marked the moment when popular entertainment became an indispensable part of modern politics. Frank Sinatra and Peter Lawford organized and hosted a pre-inaugural ball at the D.C. Armory on the eve of Inauguration day, January 19, 1961, considered as one of the biggest parties ever held in Washington, D.C. Sinatra recruited many Hollywood stars who performed and attended, and went as far as convincing Broadway theatres to suspend their shows for the night to accommodate some of their actors attending the gala. With tickets ranging from $100 per person to $10,000 per group, Sinatra hoped to raise $1.7 million ($14.3 million in today's dollars) for the Democratic Party to eliminate its debt brought on by a hard-fought campaign. Many Hollywood stars gave brief speeches or performed acts, rehearsed by Kay Thompson and directed by Roger Edens, and stayed at the Statler-Hilton Hotel where preparations and rehearsals were photographed by Phil Stern. Performances and speeches included Fredric March, Sidney Poitier, Nat King Cole, Ella Fitzgerald, Gene Kelly, Tony Curtis, Janet Leigh, Bill Dana, Milton Berle, Jimmy Durante, Harry Belafonte, and Sinatra himself. Sammy Davis, Jr., a long-time friend of Sinatra, supporter of the Democratic Party, and member of the Rat Pack, was asked by John F. Kennedy not to attend the gala at the behest of his father Joseph, fearing that his interracial marriage to Swedish actress May Britt was too controversial for the time and occasion, much to Sammy's and Sinatra's dismay. Davis had already postponed his wedding to Britt until after the election, also at the request of the Kennedy campaign via Sinatra. Davis eventually switched his support to the Republican Party and Richard Nixon in the early 1970s. Harry Belafonte expressed sadness at the controversy, stating "It was the ambassador, [but] we didn't know that until after. Sammy not being there was a loss." At the end of the ball, Kennedy spoke to thank Sinatra on the festivities and his support of the Democratic Party throughout his life and the 1960 campaign, adding "The happy relationship between the arts and politics which has characterized our long history I think reached culmination tonight." Jacqueline retired to the White House before the ball ended at 1:30am (ET), and John went to a second pre-inaugural ball hosted by his father Joseph Kennedy, and would finally return to the White House at around 3:30am. A strong nor'easter fell the day before the inauguration, with temperatures at 20 °F (−7 °C) and snowfall at 1–2 inches (2.5–5.1 cm) per hour and a total of 8 inches (20 cm) during the night, causing transportation and logistical problems in Washington and serious concern for the inauguration. On inauguration day, January 20, 1961, the skies began to clear but the snow created chaos in Washington, almost canceling the inaugural parade. The U.S. Army Corps of Engineers was put in charge of clearing the streets during the evening and morning before the inauguration, and were assisted by more than 1,000 District of Columbia employees and 1,700 Boy Scouts. This task force employed hundreds of dump trucks, front-end loaders, sanders, plows, rotaries, and flamethrowers to clear the route. Over 1,400 cars which had been stranded due to the conditions and lack of fuel had to be removed from the parade route along Pennsylvania Avenue. The snowstorm dropped visibility at Washington National Airport to less than half a mile, preventing former President Herbert Hoover from flying into Washington and attending the inauguration. Before the proceeding to the Capitol in company with outgoing President Dwight D. Eisenhower, Kennedy went to a morning Mass at Holy Trinity Catholic Church in Georgetown. Cardinal Richard Cushing gave the invocation at the inaugural which lasted for 12 minutes, with additional prayers recited by Archbishop Iakovos of the Greek Orthodox Church and Reverend Dr. John Barclay of the Central Christian Church of Austin, Texas, and a blessing offered by Rabbi Nelson Glueck. The invocation and prayers lasted a total of 28 minutes. Marian Anderson sang "The Star-Spangled Banner", and a composition by musical Leonard Bernstein titled "Fanfare for the Inauguration of John F. Kennedy" was played. The oath of office for Vice President was administered by the Speaker of the House of Representatives Sam Rayburn to Lyndon Johnson. This marked the first time a Speaker administered the oath, which had been given in previous inaugurations by either the President pro tempore of the Senate, the ex-Vice President, or a United States Senator. Robert Frost, then 86 years old, recited his poem "The Gift Outright". Kennedy requested Frost to read a poem at the inauguration, suggesting "The Gift Outright", considered an act of gratitude towards Frost for his help during the campaign. Kennedy would later state that he admired the "courage, the towering skill and daring" of Frost, and adding that "I've never taken the view the world of politics and the world of poetry are so far apart. I think politicians and poets share at least one thing, and that is their greatness depends upon the courage with which they face the challenges of life." American poet William Meredith would say that the request "focused attention on Kennedy as a man of culture, as a man interested in culture." the expanded version of "Dedication". Frost composed a new poem titled Dedication specifically for the ceremony as a preface to the poem Kennedy suggested, to the surprise of Kennedy's friends. On the morning of the inauguration, Frost asked Stewart Udall, Kennedy's future Secretary of the Interior, to have his handwritten draft type scripted for easier reading, to which Udall obliged. Once at the presidential podium, however, the glare of the sun and snow prevented him from reading his papers. When Frost started reading, he stumbled on the first three lines, squinting at his papers in view of the crowd and cameras. Vice-President Johnson tried to assist by using his top hat as a shade, however Frost waved the offer aside, took the hat and jokingly said "I'll help you with that", sparking laughter and applause from the crowd and President Kennedy. Understanding the immediacy of the situation, Frost stated to the microphones that "this [the poem] was to have been a preface to a poem which I do not have to read", and began to recite "The Gift Outright" from memory. This marks the first time a poem was read at a Presidential inauguration, a feature repeated by future Presidents Bill Clinton and Barack Obama at their respective ceremonies. Frost gave the type scripted version of the undelivered "Dedication" poem to Udall after the ceremony, who eventually donated the document to the Library of Congress where it is stored today. The original manuscript version, personally dedicated by Frost, was provided to the President and currently held by the John F. Kennedy Presidential Library. Kennedy's wife Jacqueline framed this manuscript version, writing on the back of the frame: For Jack. First thing I had framed to be put in your office. First thing to be hung there. Frost officially presented the poem, retitled to For John F. Kennedy His Inauguration and expanded from 42 to 77 lines, to Kennedy in March 1962. The unread poem (published in 1962 as part of Frost's In the Clearing poetry collection) was finally recited at the U.S. Capitol by Chaplain Daniel P. Coughlin during the 50th anniversary celebrations of Kennedy's inauguration. The oath of office for the President was administered by Chief Justice of the United States Earl Warren to Kennedy using a closed family Bible at 12:51 (ET) although he officially became president at the stroke of noon. Kennedy did not wear an overcoat when taking the oath of office and delivering the inaugural address, despite the cold conditions of 22 °F (−6 °C) with windchill at 7 °F (−14 °C) at noon. Video of John F. Kennedy being sworn in as thirty-fifth President of the United States, and delivering his inaugural address. "Inaugural address of John F. Kennedy"
Immediately after reciting the oath of office, President Kennedy turned to address the crowd gathered at the Capitol. His 1366-word inaugural address, the first delivered to a televised audience in color, is considered among the best presidential inaugural speeches in American history. The most famous passage from the inaugural address is etched in stone at Kennedy's gravesite in Arlington National Cemetery, with the Lincoln Memorial and Washington Monument in the background. The speech was crafted by Kennedy and his speech writer Ted Sorensen. Kennedy had Sorensen study President Abraham Lincoln's Gettysburg Address as well as other inaugural speeches. Kennedy began collecting thoughts and ideas for his inauguration speech in late November 1960. He took suggestions from various friends, aides and counselors, including suggestions from clergymen for biblical quotations. Kennedy then made several drafts using his own thoughts and some of those suggestions. Kennedy included in his speech several suggestions made by Harvard economist John Kenneth Galbraith and by the former Democratic presidential candidate Adlai Stevenson II. Kennedy's line "Let us never negotiate out of fear. But let us never fear to negotiate." is nearly identical to Galbraith's suggestion "We shall never negotiate out of fear. But we shall never fear to negotiate." Stevenson's suggestion "if the free way of life doesn't help the many poor of this world it will never save the few rich." was the basis for Kennedy's line "If a free society cannot help the many who are poor, it cannot save the few who are rich." As a president coming into power at the height of the Cold War, President Kennedy's duty of maintaining peaceful international relations with representing the United States as a force to be reckoned was daunting, at the very least. It is this overarching goal of his presidential term that dominates his inaugural address. Kennedy highlights the newly discovered dangers of nuclear power coupled with the accelerating arms race, and essentially makes the main point that this focus on pure firepower should be replaced with a focus on maintenance of international relations and helping the impoverished in the world. The main focus of the speech can crudely be boiled down to one theme – the relationship between duty and power. This is emphasized by Kennedy's strong use of juxtaposition in the first part of the speech. For example, he states in the second passage, "... Man holds in his mortal hands the power to abolish all forms of human poverty and all forms of human life," a clear calling-out of not only America, but also other nations of power for skewed Cold War priorities. He again employs the strategy in the fifth passage when he says, "United there is little we cannot do in a host of cooperative ventures. Divided there is little we can do," again appealing to the idea of refocusing of international values. Again, after exhorting "both sides" to action, he calls on all of "us" "to bear the burden of a long twilight struggle ... against the common enemies of man: tyranny, poverty, disease, and war itself," though the phrase "long twilight struggle" came to be associated with the cold war struggle against communism. One of the main components of classical rhetoric, to prepon (the appropriate), is also extremely prevalent in this address. Recognizing the fear and anxiety prevalent in the American people since the start of the Cold War, Kennedy geared his speech to have an optimistic and even idealistic tone as a means of providing comfort. He does this by quickly moving the time of the speech into the future, and invokes repetition of the phrase "Let both sides ..." to allude to how he plans to deal with strained relations while also appealing to the end goal of international unity. He also phrases negative ideas in a manner so as to present them as opportunities – a challenge, appealing to innately American ideals. A great line to emphasize this is in the fourth from last passage, where he states, "In the long history of the world, only a few generations have been granted the role of defending freedom in its hour of maximum danger," a simple twist of words that challenges the American public rather than frightening them. 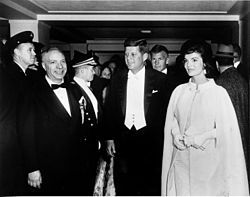 Along with official presidential guests and honorees, including former presidents, vice-presidents, cabinet members, and other Washington officials, the Kennedys invited famous men and women of the arts, including Carl Sandburg, John Steinbeck, Ernest Hemingway, Brendan Behan, Mark Rothko, and fashion icon and future Vogue editor Diana Vreeland. O'Neill recalled that Kara had nudged him and said, "Years from now, historians will wonder what was on the young man's mind as he strode to take his oath of office. I bet he's asking himself how George Kara got such a good seat." That night, O'Neill and his wife danced over to the president's box at the ball in the Mayflower Hotel to congratulate him, and sure enough, Kennedy asked, "Was that George Kara sitting beside you?" O'Neill told Kennedy what Kara had said, and J.F.K replied, "Tip, you'll never believe it. I had my left hand on the Bible and my right hand in the air, and I was about to take the oath of office, and I said to myself, 'How the hell did Kara get that seat?'" Five first Ladies, Edith Wilson, Eleanor Roosevelt, Bess Truman, Mamie Eisenhower and Jackie Kennedy attended the event, as did future First Ladies Lady Bird Johnson, Pat Nixon, and Betty Ford. Former President Harry S Truman joined Presidents Eisenhower and Kennedy on the platform, as did future Presidents Lyndon B. Johnson, Richard M. Nixon and Gerald Ford, making this, retroactively, the largest conclave of the "presidential fraternity" prior to the opening of the Reagan Library in the 1990s. A vast parade along Pennsylvania Avenue followed the inauguration ceremony, bearing the new President from Capitol Plaza to the White House. Upon his arrival, Kennedy mounted a reviewing stand shared with honored guests such as former President Harry Truman and former First Ladies Edith Wilson and Eleanor Roosevelt. Throngs of onlookers and millions of television viewers also watched the procession; it took three hours to pass by. Sixteen thousand members of the US armed forces marched with displays of modern weaponry like the Minuteman missile and the supersonic B-70 bomber. A further sixteen thousand marchers were civilians ranging from federal and state officials to high school bands and Boy Scouts, accompanied by forty floats. Kennedy's inauguration marked many firsts for the United States. Kennedy was the first, and to this date, the only Catholic inaugurated as commander-in-chief. At the inauguration, Kennedy, then 43, was the youngest elected president and was replacing the oldest president in American history at that time, Eisenhower. The age difference and visual impact of the turnover from Eisenhower's presence to Kennedy's was noticeable at the inauguration. In addition, Kennedy was the first person born in the 20th century to have been inaugurated as President. ^ Bragdon, Henry W. (1998). History of a Free Nation. New York City, NY: Glencoe/McGraw-Hill. ^ "List of United States Congress Joint Committee on Inaugural Ceremonies (from 1901)". Senate.gov. United State Senate. Archived from the original on 16 November 2013. Retrieved 15 February 2014. ^ a b c d e f g h i Purdum, Todd (February 2011). "From That Day Forth". Vanity Fair. Retrieved 2011-01-18. ^ a b c d e f g h Doyle, Jack (21 August 2011). "The Jack Pack, Pt. 2: 1961-2008". PopHistoryDig.com. Retrieved 16 February 2014. ^ Jacobs, George; Stadiem, William (2003). Mr. S.: The Last Word on Frank Sinatra. New York: HarperCollins. ISBN 0-06-051516-3. ^ a b c d e f g h Jason Samenow (January 9, 2009). "Inauguration Weather: The Case of Kennedy". The Washington Post. Retrieved February 10, 2010. ^ a b c "Presidential Inaugural Weather: Worst Traffic Jam - 1961". U.S. National Weather Service. Retrieved 11 February 2014. ^ Paul J. Kocin and Louis W. Uccellini (2004). Northeast Snowstorms. American Meteorological Society. p. 400. ISBN 1-878220-64-0. ^ Andrea Stone (February 10, 2010). "Record Falls With Snow in Washington, DC". AOL News. Archived from the original on February 12, 2010. Retrieved February 10, 2010. ^ National Weather Service Sterling, VA. "Presidential Inaugural Weather". National Oceanic and Atmospheric Administration. Retrieved February 10, 2010. ^ a b "Newdow v. Bush, 391 F. Supp. 2d 95 (D.D.C. 2005), Appendix D: Inaugural Clergy" (PDF). United States District Court, District of Columbia. 17 December 2004. p. 2 of Appendix, footnote 26. No. Civ.A.04-2208(JDB). Retrieved 2014-02-11. ^ a b "President John Fitzgerald Kennedy, 1961". Joint Congressional Committee on Inaugural Ceremonies. Retrieved 2009-01-21. ^ "Inaugurals of Presidents of the United States: Some Precedents and Notable Events". Library of Congress, citing Roll Call article of 18 January 1961. Retrieved 15 February 2014. ^ a b c Wolly, Brian (17 December 2008). "History & Archaeology: Inaugural Firsts - When was the first inaugural parade? Who had the longest inaugural address? A look at presidential inaugurations through time". Smithsonian Magazine. Retrieved 26 January 2013. ^ a b c d Wirzbicki, Alan (11 January 2011). "The poem Robert Frost wanted to read at John F. Kennedy's inauguration". Boston.com. Boston Globe. Retrieved 11 February 2014. ^ a b c d e f g Associated Press (30 January 1963). "Robert Frost Dies at 88; Kennedy Leads in Tribute". New York Times. Retrieved 11 February 2014. ^ a b "Robert Frost Adds Poet's Touch". The New York Times. 21 January 1961. ^ a b c d "Poetry and Power: Robert Frost's Inaugural Reading". Poets.org. Retrieved 11 February 2014. ^ a b c Camia, Catalina (26 September 2010). "Why poet Frost made a last-minute switch at JFK's inauguration". USA Today. Retrieved 11 February 2014. ^ a b c Birney, Alice. "Stewart L. Udall Collection: Robert Frost's Dedication". Library of Congress. Retrieved 11 February 2014. ^ a b "The Poetry of Robert Frost". Library of Congress. Retrieved May 5, 2010. ^ Michael E. Ruane (2008-12-17). "Selection Provides Civil Rights Symmetry". Washington Post. Retrieved 2009-01-15. ^ Rosenthal, Harry (20 January 1997). "Poet Addresses Inaugural Event". Washington Post. Retrieved 11 February 2014. ^ a b "Robert Frost's Original Poem for JFK's Inauguration Finds Way to Kennedy Presidential Library". John F. Kennedy Library and Museum. JFKPOF-140-045. Retrieved January 8, 2008. ^ "John F. Kennedy and Ireland – John F. Kennedy Presidential Library & Museum". Jfklibrary.org. Retrieved August 30, 2010. ^ New York Times, January 21, 1961, p. 8, col. 1. ^ "White House Diaries". John F. Kennedy Library and Museum. Retrieved January 8, 2008. ^ "Kennedy Was in Office Despite Delay in Oath". The New York Times. January 21, 1961. p. 13. ^ a b "Kennedy's Words, Obama's Challenge". The New York Times. January 19, 2009. ^ Peters, Gerhard (ed.). "Inaugural Addresses (including length in words) Washington – Trump". University of California, Santa Barbara: The American Presidency Project. Retrieved October 17, 2018. ^ Kennedy, John Fitzgerald. "Inaugural Address". American Rhetoric. Retrieved July 7, 2008. ^ Wyatt, Edward (10 May 2005). "Two Authors Ask About 'Ask Not'". New York Times. Retrieved 11 February 2014. ^ "Greatest speeches of the 20th century". The Guardian. Retrieved 12 February 2014. ^ a b "John F. Kennedy Quotations: President Kennedy's Inaugural Address, January 20, 1961". Boston Massachusetts: John F. Kennedy Presidential Library and Museum. Retrieved October 17, 2018. ^ JFK Library. "Analyzing the Inaugural Address" (PDF). Retrieved January 21, 2011. ^ National Archives and Records Administration. "John F. Kennedy's inaugural address, 1961". Retrieved January 29, 2008. ^ "Analyzing the Rhetoric of JFK's Inaugural Address" (PDF). Department of Education and Public Programs, John F. Kennedy Presidential Library and Museum. John F. Kennedy Presidential Library and Museum. Retrieved 8 January 2013. ^ "John F. Kennedy Inaugural Address". Bartleby. Retrieved October 4, 2013. ^ "The Timeless Speech: A Close Textual Analysis of John F. Kennedy's Inaugural". Biane. Retrieved October 5, 2013. ^ Thurston Clarke (2010). Ask Not: The Inauguration of John F. Kennedy and the Speech That Changed America. Penguin. p. 39. ISBN 9781101478059. ^ Thomas Alan Schwartz (1994). "Victories and Defeats in the Long Twilight Struggle: The United States and Western Europe in the 1960s". In Diane B. Kunz (ed.). The Diplomacy of the Crucial Decade: American Foreign Relations During the 1960s. Columbia University Press. p. 115. ISBN 9780231081771. ^ "Toward a Sophistic Definition of Rhetoric." Poulakos. Philosophy and Rhetoric 16(1983):35–48. ^ "Acceptance Speech for the Renomination for the Presidency, Philadelphia, Pa". presidency.ucsb.edu. Retrieved 2018-06-04. ^ "Dazzling Military Might Goes On Parade for New President". The Terre Haute Tribune. Terre Haute, IN. UPI. January 20, 1961. Retrieved December 10, 2016 – via Newspapers.com. ^ Frank Freidel and Hugh Sidey. "The Presidents of the United States of America: John F. Kennedy". WhiteHouse.gov. White House Historical Association. Archived from the original on 2 June 2011. Retrieved 31 May 2011. ^ Reuters (May 17, 1981). "Reagan Now Oldest President". The New York Times. p. 28. ^ Lawrence, W.H. (January 21, 1961). "Kennedy Sworn in, Asks 'Global Alliance' Against Tyranny, Want, Disease, and War; Republicans and Diplomats Hail Address". The New York Times. p. 1. ^ Business Insider. "Donald Trump is the oldest president elected in US history". Business Insider. Retrieved 12 May 2017. ^ Brooks, David (14 March 2011). "The Ike Phase". The New York Times. Retrieved 12 February 2014. ^ Crouch, Ian (20 January 2011). "Robert Frost and J.F.K., Fifty Years Later". The New Yorker. Retrieved 12 February 2014. ^ Robert Krulwich (4 May 2012). "Who Killed Men's Hats? Think Of A Three Letter Word Beginning With 'I'". NPR. Retrieved 16 August 2015. ^ Sam Parker (19 November 2013). "How to wear a hat and look good". Esquire. Retrieved 16 August 2015. ^ a b c d "Hat Trick". Snopes. 27 September 2007. Retrieved 16 August 2015. ^ a b "Inaugural Traditions: Dude, Where's My Top Hat?". ABC News. 19 January 2009. Retrieved 16 August 2015. Clarke, Thurston Ask Not : The Inauguration of John F. Kennedy and the Speech That Changed America. New York: Henry Holt and Co., 2004. ISBN 0-8050-7213-6. Rhetorical Terms and Techniques of Persuasion from Kennedy’s Inaugural Address. United States Department of Education and Public Programs, John F. Kennedy Presidential Library and Museum. This page was last edited on 6 March 2019, at 01:35 (UTC).